As of 2018, the Speaker was Democrat Mitzi Johnson of the Grand Isle-Chittenden District. The Majority Leader was Democrat Jill Krowinski of the Chittenden-6-3 District. The Republican Minority Leader was Republican Donald H. Turner of the Chittenden-9 District. The Progressive Minority Leader was Progressive Robin Chesnut-Tangerman of the Rutland-Bennington district. The Clerk of the House was William M. MaGill. 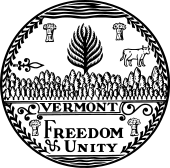 ^ "Home | Vermont General Assembly | Vermont Legislature". legislature.vermont.gov. Retrieved 2018-04-07. ^ "Clerk of the House | Vermont General Assembly | Vermont Legislature". legislature.vermont.gov. Retrieved 2018-04-07.